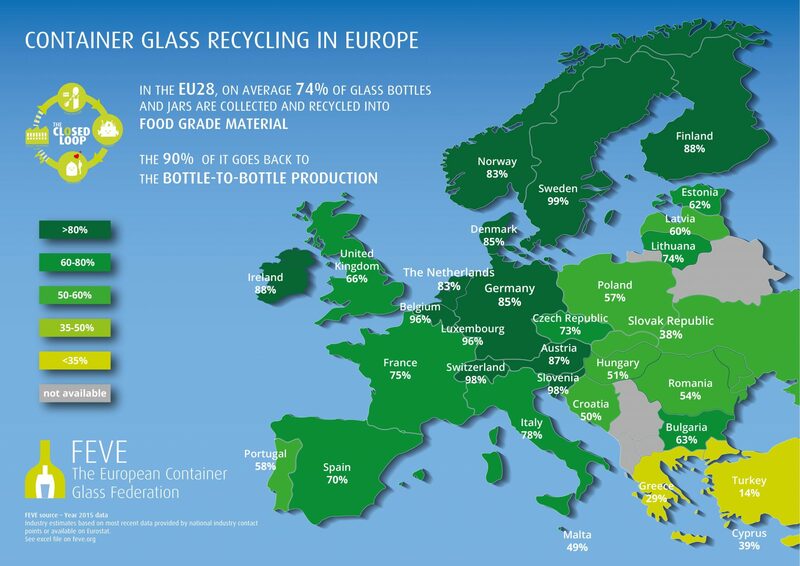 Latest industry data on glass recycling show that the average glass recycling rate in the EU28 is steady at 74%. This means that over 11.6 million tons of glass bottles are collected, and recycled into food grade quality material for the production of new glass containers. Countries such as Belgium, Slovenia or Sweden, with excellent separate collection systems, continue to outperform beyond 95%. While glass stands alone as the most circular packaging solution, maintaining permanent quality even when recycled, the reality is that there is still an important collection gap to fill in many EU countries. As pointed out at the Euractiv Event today, real recycling is a balancing act between developing materials that are recyclable, and markets that are open to use recycled material. “More and more effort is being put at European level to use recycled material for new food packaging”, says Jean-Paul Judson, FEVE Public Affairs Manager. “Recycled glass is of food grade quality. It goes straight into new food or beverage containers. We want to engage with policymakers to make this model the reference”. The circular economy begins again as it ends.